For Elizabeth Villa, 2017 was a banner year. Earlier this year, the biophysicist and assistant professor of molecular biology received her first of four years of research funding from the Pew Charitable Trusts following her selection last fall as a Pew scholar. Villa was one of only 22 early-career biomedical researchers nationwide to win the prize. 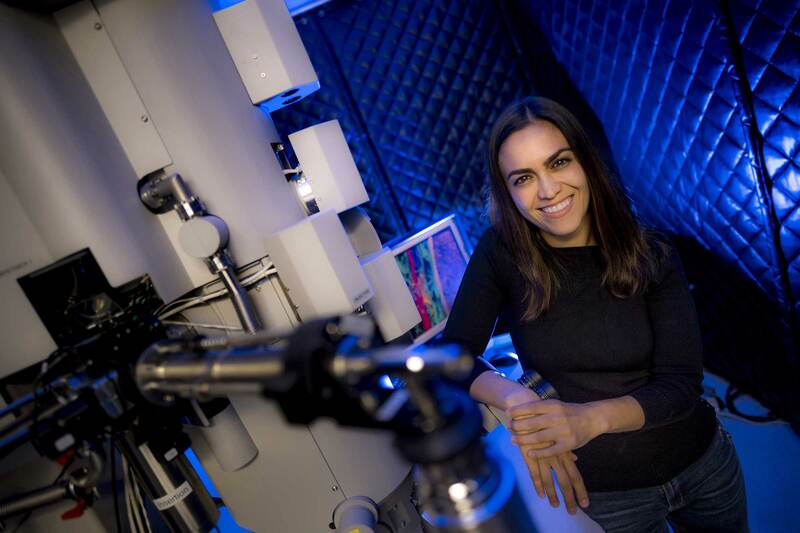 After submitting a novel proposal to build tools to unveil the architecture of the nucleus and determine how it communicates with the rest of the cell, she acquired $2.3 million in research funding from a prestigious NIH Director’s Innovator Award. She was also awarded, with a senior female faculty member and other collaborators, a multimillion dollar research grant from the National Institutes of Health and a $620,000 Michael J. Fox Foundation research grant. Villa, who arrived at UC San Diego after a postdoctoral fellowship only three years ago, is part of a group of young faculty on campus whose out-of-the-box approach to solving research problems has allowed them to quickly gain recognition, academic prizes and funding. She’s also an example of another noteworthy campus trend—female scientists who, despite their minority status in STEM fields, are pulling in the biggest research grants awarded to UC San Diego. As is the case at other top research universities, women scholars here are in the minority. They account for only 25 percent of the tenure-track faculty and 36 percent of the other research appointments at UC San Diego. But of the 10 largest grants awarded to researchers on the main campus this year, women serve as the leaders—or principal investigators—for eight of them. In the health sciences, which includes UC San Diego’s medical and pharmacy schools, six of this year’s top 10 grants by dollar amount are headed by women. It’s not just a one-year spike. Over the past five years, the number of women principal investigators on the 40 biggest research grants awarded to the main campus and health sciences has steadily grown, this year surpassing those led by men (see related story below). No one knows for certain why or whether similar trends are occurring at other top research institutions. That’s not to say gender bias or discrimination doesn’t exist—either implicit or explicit—within our research community. However, many scientists including Brown point out that UC San Diego’s relative youth, when compared to other top research institutions, and its growing tradition of hiring and promoting prominent scientists regardless of gender is enabling UC San Diego to advance women in science. Another major factor fueling the trend of women overtaking men in the biggest grant awards, Brown, Villa, Pogliano and many other scientists point to, have been the efforts by Chancellor Pradeep K. Khosla and other campus leaders to eliminate roadblocks and inequities that stand in the way of hiring, retaining and promoting women and others from underrepresented groups. “We’ve been working hard to eliminate the inequities in climbing the academic ladder and paying much more attention to this problem from a cultural perspective,” said Brown. Although this has been more of an institutional priority now than in the past, UC San Diego has long been a noted leader among research institutions in advancing women in science. Maria Mayer, the second and most recent woman to win a Nobel Prize in Prize in Physics, was one of the campus’ founding faculty members. Margaret Burbidge was another. A prominent female astrophysicist who paved the way for other women to pursue careers in astronomy, Burbidge won a National Medal of Science and, in 1976, became the first female president of the American Astronomical Society. In 1979, she was appointed the first director of UC San Diego’s Center for Astrophysics and Space Sciences. Sally Ride, the first American woman in space, was recruited in 1989 to head the California Space Institute on the campus and became a longtime member of the physics faculty and a mentor to hundreds of girls considering science careers. Fran Berman, a former computer science and engineering professor appointed in 2001 to direct the San Diego Supercomputer Center, was the first and remains the only woman to head a major national supercomputer center. Another hallmark of our campus since its founding has been its emphasis on interdisciplinary collaboration, a tradition that some think has contributed to the rise in the number of women leading large grants on campus. In addition, women tend to manage and maintain order within large collaborations of scientists from different disciplines for reasons that female scientists generally acknowledge, but are hesitant to talk about on the record for fear of perpetuating gender stereotypes. Having women in leadership positions in research collaborations as well as faculty and administrative positions on a campus can provide other facilitative benefits—such as role models for female students considering STEM careers. Women make up 51 percent of the U.S. population and 47 percent of the total workforce, according to U.S. Labor and Bureau statistics, but only 39 percent of chemists and material scientists, 28 percent of environmental scientists and geoscientists, 16 percent of chemical engineers and 12 percent of civil engineers. Joanna Coker, a second-year student in UC San Diego medical school’s M.D./Ph.D. program who completed her undergraduate degree here, concurs. Diversity benefits accrue on the administrative side as well. Chancellor Khosla has built a diverse senior management leadership team that is half women. Gender balance changes the dynamics in discussions. Studies show that companies that have boards that are more diverse and have more women outperform those that have less diverse boards. Different personality styles and different cultures broaden perspectives and lead to informed decisions that are thoroughly considered from all points of view. Villa said she saw that progressive management style first hand when, as a newly hired assistant professor, Chancellor Khosla invited her to his house for dinner along with 11 other new assistant professors, and asked each of them to explain what they were doing and what difficulties they were experiencing—something he tries to do often.